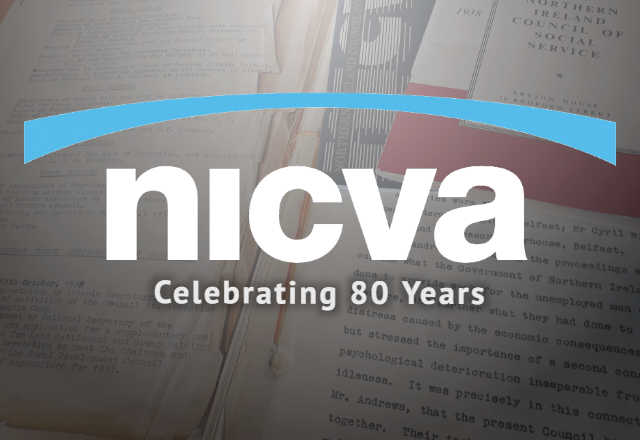 You can get an overview of NICVA's entire past on 'Our History' timeline. Starting life as the Northern Ireland Council of Social Service, the first meeting of the Central Committee took place in a Northern Ireland that despite being very much an industrial powerhouse, still lived in the shadow of the Great Depression and the economic crash of 1931. While unemployment rates were no greater than during the recessions of the 1980s or 2000s, the effects of long-term unemployment – a relatively new and not well understood phenomenon – had been brought into sharp relief. Increasingly the focus of policy makers, a growing amount of legislation had been passed that aimed at giving some degree of protection to those who found themselves out of work. Acts for National Insurance and Unemployment Insurance were passed in 1911 and 1927 respectively. In response to the Depression, the Unemployment Insurance Act 1930 reformed the benefits system and a Royal Commission on Unemployment was established. This led to the Unemployment Act of 1934 which introduced unemployment benefit for those who had made qualifying contributions to the Unemployment Insurance Fund. There was also unemployment assistance for those who hadn’t. Against this backdrop entered Stormont Finance Minister, J.M. Andrews. Andrews – who was later to become Prime Minister of Northern Ireland – is best remembered for his ‘step-by-step’ mantra, in which he sought to emulate social programmes in Great Britain. He was also a founder member of the Unionist Labour Association and had steered the Department of Labour through the early 1930s. The foundation of the NICSS was entirely consistent with both strands of the politics of Andrews who, in addressing the opening meeting of the Central Committee, made specific reference not only to the “tragedy of unemployment” but to the National Council of Social Service in Great Britain (the precursor to the National Council for Voluntary Organisations), whose work to better “the social welfare of the unemployed” he hoped to emulate. Early July 1938 was eventful both across the globe and in Northern Ireland. 2,000 veterans of the Battle of Gettysburg, all of whom were aged over 90, gathered on the battlefield in Pennsylvania to commemorate its 75 year anniversary. There were sporadic outbursts of violence in Palestine. The Newsletter informed its readers that “girl flier” Joan Parsons had gone missing attempting to fly from Capetown to England. She later resurfaced after spending a few weeks in a central African village. Two East Belfast men were revealed to be in residing in one of Franco’s prisoner of war camps outside Burgos. The Museums Association arrived in Belfast for their annual conference, and a Belfast Telegraph editorial welcomed them to a “relatively stable and prosperous” Northern Ireland. A plane – the Star of Scotia - crashed at Tillsyburn while attempting to land at the Belfast Harbour Airport and souvenir hunters had to be chased away from the scene. Northern Ireland’s unemployed had risen over the previous month to 91,636. More people were becoming employed in heavy industry and fewer in farming and textiles. It was these people who were foremost on the minds of the NICSS in as they sat down for their first meeting. Addressing the meeting Andrews outlined both the economic and psychological consequences of unemployment. The first, Andrews said: “Parliament has dealt with” in the form of “very large sums pad out week by week in unemployment benefit by the Ministry of Labour and in unemployment assistance by the Unemployment Assistance Board”. It was with the prevention and alleviation of these psychological consequences that the Council was to primarily concern itself. The group was keen to coordinate what was being done by various organisations acting in a voluntary capacity and bring some order to the “scattered effort”. At that first meeting, after a discussion about the shortage of domestic servants, it was also agreed that vocational training would not be dealt with as it seemed counter-productive to train people for specific jobs that didn’t exist. The Council agreed to focus on stimulating the formation of clubs and garden plot associations which would help eliminate “the psychological deterioration inseparable from prolonged idleness”, encourage people to work together, and help to feed the hungry. Work camps were also prioritised. These were typically run by the YMCA and similar organisations and, by 1938, were an established method of coping with the consequences of unemployment. A strict regime of manual labour kept men fit while they waited on a job. To this end, the Council’s first expenditure was £200 for the YMCA to run a work camp at the Government Farm in Richhill, Co. Armagh. To assist in their efforts the Council had been allocated £3,000 from the Ministry of Labour. Equivalent to about £141,000 in today’s money, the Committee Members immediately remarked that some fundraising of their own would be needed if the Council was to make an impact beyond mere administration. Having sought to share an office with an organisation engaged in a similar field, the Council began to meet at 29 Wellington Place, which was then home to the Rural Development Council. “Great is the range of welfare services for which the state is now responsible, there is still a wide field where voluntary social service, with its greater freedom of action and more individual approach, can make an invaluable contribution to the gradual remodelling of communal life on lines more in accordance with our professed ideals. Ever conscious of the need to address the effects of unemployment, the Council sought to make contact with existing provincial and local development services, research the field of social service, and encourage the formation of community organisations through financial assistance or the provision of staff time. The Council had initially been loaned the services of John Oliver by the Ministry of Labour to act as Secretary. However, to assist in their work the Council soon hired its first employee: L.E.G. Laughton as Secretary-Organiser. Laughton had moved from the Carnegie Trust where he had been the Scottish Rural Organiser. He was appointed after a highly competitive interview process which cumulated in a run-off with a Mr C. F. Paddison, Assistant Warden at King’s Standing Demonstration Centre in Burton-on-Trent. For an annual salary of £550, motoring expenses of £60 per quarter, and 24 days holiday a year, Laughton was to organise clubs, community centres, occupational classes, summer camps and garden plot associations, as well as provide general administration. He soon began the job of coordinating the welfare clubs that had been in touch with the Council. Many of them ran successful garden plot schemes but the type of facilities and activities offered were found to vary according to the location. Coleraine had a male voice choir. Lurgan and Portadown offered gymnastics. Keen to drive more practical offerings into the lives of the welfare clubs, the Council hired a Carpentry Instructor and a Garden Plots Coordinator, and paid for the YMCA to employ a second Gymnastics Teacher. Support for work camps also continued, with money being given to the YMCA to run a further camp at Macosquin. By the end of 1938 the Council had four employees, with the addition of a full time Clerk, Miss Patrick. It has also been granted the use of Richhill Castle by J.M. Andrews for use as accommodation to assist the running of work camps. 1939 started on a positive note when the Ministry of Labour confirmed that it would double the Council’s grant to £6,000 in 1939-40. Further funds were received from the Carnegie United Kingdom Trust, which promised £2,000 for “experimental schemes in connection with starting group schemes for unemployed men”. They further promised £500 for the salary of an Allotment Organiser. During this time the Council paid out considerable sums to meet its aims, including for the training of work leaders, for alternations to a building in Bangor which was going to be used as a welfare club, for the levelling of ground on the Shore Road for use as a garden plot, for a full-time organiser for the Belfast Union of Girls' Clubs, for fitness equipment that would be loaned to welfare clubs and for a physical training display in Portadown. Mr Laughton, the Council’s Organiser-Secretary appears to have run up a considerable number of miles between running weekend training sessions at Lisnabreeny House and travelling to various locations across Northern Ireland to receive updates on welfare clubs, work camps and occupational courses. In May 1939 however, Mr Laughton died suddenly. The Council immediately offered the position to Mr Paddison who, after some consideration turned the position down. Harold King, Warden of the Liverpool University Settlement was appointed. As if the death of a new Secretary in a new organisation wasn’t shock enough, the outbreak of war in September 1939 had an immediate and profound effect on the Council. Four committee members – John Carr, J.E Johnston, Cyril Nicholson and Professor Waterhouse immediately departed on active service and many of the day-to-day tasks undertaken by the new Secretary were frustrated by the sudden uncertainty. Cheques couldn’t be signed and Mr King even had to apply for an extra petrol ration in order to go about his business. Having initially thought that the coming of war would lead to a sudden and dramatic increase in employment, the Council decided that it was necessary to approach the government to find out what it envisaged their role as during the war. Throughout the early months of the war the Council demonstrated remarkable prescience. Anticipating a greater role for women it expanded its Women’s Advisory Committee and appointed a part-time organiser, Mrs Hardy, to liaise with other bodies. It also suggested to the government that there may be social problems stemming from the mass evacuation of children. Finally the Council considered the post-war years and took steps to plan ahead to a time when they envisaged that pre-war problems would return with a vengeance. While we now know that unemployment didn’t fall as rapidly as expected, we also know that the war time evacuation scheme left many children open to abuse and exploitation and the war heralded a transformation in the role of women in society. To see what lessons could be learned from the evacuation scheme in England, the Council sent Mr King over the water to investigate. He concluded that there were several failures that the Council could learn from. He also investigated the possibility of funding Poor Man’s Lawyers, as it was felt that the war would increase the demand for legal assistance. This eventually led to voluntary committees being formed in several towns to fulfill the legal needs of those who would not otherwise afford lawyers. Steadily, those who used welfare clubs began to drift off into employment. Several more Council members, including the Chairman, Mr Bryson, left for war. A call for increased food production meant to the Council played a direct role through the central Allotments Committee and Mr King was seconded to the Civil Defence Authority to organise rest centres and prepare an emergency feeding scheme. Gradually, the Council found that many of the agencies it liaised with were suspended. The YMCA Red Triangle Club on the Ravenhill Road, which the Council provided assistance to was commandeered by the military. The Council’s research work was also called into question as it was felt that the War gave rise to "artificial conditions" that would limit the effectiveness of surveys it wanted to carry out. An increase in the cost of postage meant it was more cost effective to deliver mail by hand. This led to the hiring of a “Junior Girl” to deliver letters and help in the office. Despite these setbacks and a great deal of uncertainty the work of the Council continued for the duration of the War. It sponsored the formation of a Federation of Boys’ Clubs, submitted evidence to the Ministry of Education on the problems of youth welfare and co-operated with the Belfast Council of Social Welfare looking at the need for youth hostels and remand homes. The Council also directly assisted in the aftermath of the Belfast Blitz, when as custodians of Ewart House in Bedford Street they assisted in “alleviating the distress of homeless people and in sustaining the general moral of the neighbourhood”.